Two finals many saw coming, and one that.... was surprising. During the 2018 summer and fall season, we will publish a bite-sized weekly recap of the action across the Club Division. This will serve as a supplement to our standard tournament reporting and will offer a high-level look at the latest happenings and the biggest stories of the week. The US Open is the biggest event that USAU puts on every year and the 2018 tournament proved as exceptional as last year with the International Club Championships being combined with the Youth Club Championships. Although the team yours truly coaches lost in a heartbreaking quarterfinal rematch of last year’s Boy’s U20 final, it was still an amazing weekend for all involved. Let’s see how teams from the EIGHT1) divisions fared. From Day One on it was clear that we were on a collision course for a rematch of the WUCC semifinal as new #1 Philadelphia AMP and #3 Seattle BFG both looked like the class of the division, each winning their pools with perfect 5-0 records. The world champions had some scares, winning two of their games on universe; meanwhile AMP swept through the field including demolishing WUCC runners up #5 Boston Slow White by ten. The final was a thriller going down to the wire, but AMP proved they could beat anyone in the division, claiming the first leg of the Triple Crown Tour 15-13. It was a tough weekend for #6 Seattle Mixtape, who has simply looked lost so far this season, first losing in the quarterfinals in Cincinnati and then going 0-3 on the first day in Blaine before eking out two 2-point wins on day two. International teams didn’t fare much better, only collecting two pool play wins, both by Germany Mixed. For more coverage of the mixed division at the US Open, check out our Friday and semis (1, 2) recaps, along with all the scores. Utilizing a (criminally underused) swiss draw format on Saturday, White Mountain Mixed mixed things up from the traditional pool play followed by bracket play we are all so used to. #25 Boston League of Shadows swept through all competition, beating Bar Harbor Titan NE twice en route to a championship. At Heavyweights, longtime staple of the mixed division Ames The Chad Larson Experience took down Omaha Woodwork 13-11 in the final to claim the tournament. Seattle Garbage2 bounced back from a pool play loss to take home the crown at Kleinman Eruption. In the the final, Garbage beat Oregon Happy Hour, who had knocked off top-seeded Seattle Lights Out in the semis. Phoneix ROBOS rode an undefeated weekend to a 5-0 record and a championship at Coconino Classic, upsetting Long Beach Legacy in the final 14-8. There was a three-way tie atop the WC Mixed Round Robin in Allentown, PA, with Montclair The Bandits coming out ahead of West Chester Stoke and Lancaster Distelfink by way of point diff, capturing the top spot. In an all-Texas field at PB&J, Dallas Risky Business overcame Austin Moontower 14-7 in the final to complete an undefeated weekend. In the Women’s division, the US Open final was again a rematch of a game from WUCC, this time a quarterfinals that saw #2 Boston Brute Squad knock out #3 San Francisco Fury; in the rematch, Brute Squad emerged on top once again, 15-11. Both teams looked like they were on the warpath after disappointing finishes at worlds. Brute pounded their pool play opponents all of Friday and Saturday as no one got closer than 15-10. Fury had a slightly closer game, a 15-11 win over #4 Denver Molly Brown, but looked just as dominant and they continued it in the bracket downing #6 Washington D.C. Scandal by ten. Denver put up a fight against Boston in the other semifinal and stuck around all game, even after Boston had opened up the game in the first half. The lone international team in the division, Black Widows, collected only one win, in the last place game. Scandal had an up-and-down weekend, claiming wins over teams they “should” beat but then falling flat against Boston, San Francisco, and Denver, sealing their spot out of the top tier of the women’s division. For more coverage of the women’s division at the US Open, check out our Friday, Saturday, and semis (1, 2) recaps, along with all the scores. In the only other women’s action on the weekend, #10 Madison Heist easily rolled through the competition at Heavyweights; they went 7-0 with a point differential of +61. Another tournament, another column about how Chris Kocher and Jimmy Mickle tore it up at said tournament. Just like they did for Sydney Colony at WUCC, the two superstars were untouchable for #3 New York’s PoNY in bracket play. After a shaky first two days of play, something ignited in the New York squad who took down #4 Raleigh Ring of Fire then an impressive #7 Minneapolis Sub Zero squad who had dispatched #1 San Francisco Revolver the day before. Revolver subbed evenly throughout the tournament, keeping their two D-lines intact and not crossing over players to earn extra breaks. It may be just a worlds hangover, but the rest of the division is really hoping this is a sign of a chink in the armor more teams can exploit. In the end, the weekend belonged to the boys from New York, as PoNY eased past Sub in the surprising final matchup. Bunka Shutter Buzz Bullets were almost in the bracket before #13 Washington D.C. Truck Stop blew a late lead to PoNY giving the New York club the win they needed to take the second spot in the pool. The three other international teams at the tournament went a combined 1-14 with no wins over American clubs. Other noticeable storylines were #8 Chicago Machine working out the kinks with Kurt Gibson and #14 Austin Doublewide dearly missing the services of Gibson. For more coverage of the men’s division at the US Open, check out our Friday and semis (1, 2) recaps, along with all the scores. #5 Pittsburgh Temper cruised to a tournament title at Heavyweights, never giving up double digits, including a 13-6 dismantling of Indianapolis Brickyard in the final. The performance does a lot to prove their early season showing at the Pro Elite Challenge was no fluke. Houston Clutch capped off an undefeated weekend at PB & J with a win over fellow Houstonites Papa Bear. Additional Reporting from Joel Prushan: With Philly Open postponed for rain and El Nino already on their way from Florida, four teams came together in West Chester for an unsanctioned round robin. El Nino won the day with a 3-0 record, the closest game a 12-11 hard cap win against Adelphos. Like masters a couple weeks ago, we’re adding a special section this week to recognize the incredible youth talent that was on display at the Youth Club Championships this year. Rarely thought of as an ultimate hotbed, San Diego Powerline picked up one of the city’s biggest ever tournament titles, earning the Mixed U20 crown over Seattle Bankroll in a double game point final, 15-14. Raleigh Warhawks earned back-to-back titles in the Girls U20 division, defeating Washington DC Rogue 14-11 in a rematch of last year’s final. 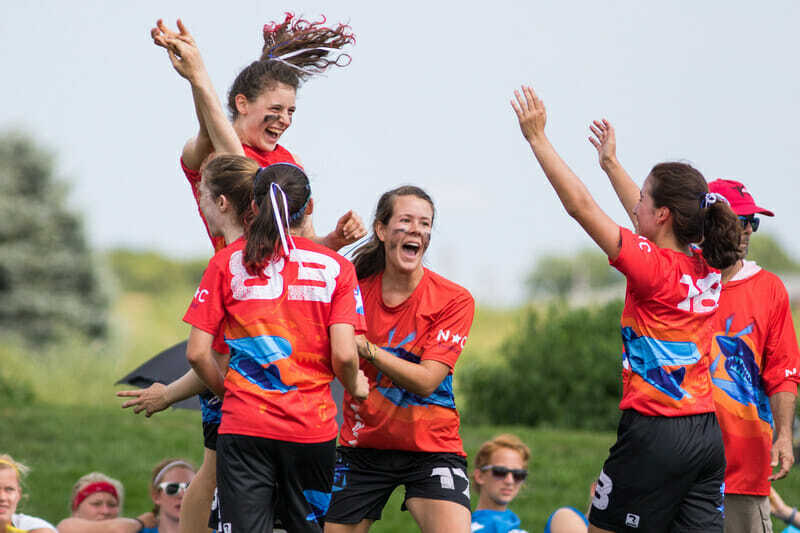 After years of finishing behind Seattle, Cincinnati Belle finally overcame their nemesis from the Northwest, topping Seattle Insidious 10-6 to win their first-ever Girls U17 championship. For the first time since 2013, the Boys U20 final did not feature squads from either Boston or the Raleigh Triangle. Instead, fifth-seeded Washington DC Foggy Bottom Boys were able to avenge a pool play loss to Seattle Supreme, winning the rematch in the Boys U20 championship game 13-12. Seattle was able to maintain their stranglehold on the Boys U17 division, as Space Jam defeated Oregon Eruption 13-10 for the city’s seventh consecutive win in the division. The big event this weekend is the Chesapeake Open in Boyds, MD. The mixed division in particular could have a huge impact on the eventual bid picture, with six ranked teams in attendance including the much-awaited return of #3 Washington DC Space Heater to the fold. They could have their hands full with #9 Boston Snake Country and #11 West Chester Loco, both trying to consolidate their hold on strength bids for their respective regions. On the men’s side, #23 Huntsville Freaks try to hang on to their spot at the back end of the power rankings against Baltimore Medicine Men and Cleveland Smokestack squads that are close on their heels and seeded ahead of the Freaks in Boyds. The women’s division is the only one without any ranked teams in attendance; top-seeded Virginia Rebellion will be looking for a repeat performance from last time out when they won Club Terminus over a similar collection of teams, including Gainesville Tabby Rosa. A rescheduled Philly Open will feature competition in the Men’s, Mixed, and Women’s divisions for Midwest and East Coast teams, as will Jersey Devil. Nucci’s Cup will see teams from the Men’s and Women’s divisions square off in Mercerville, NJ, while HoDown XXII will host mixed teams in Asheville, NC for the weekend. Comments on "Club Update: Drama At The US Open"